Each year brings new talent for Tulane football. As the winter holidays came and passed, head coach Willie Fritz and the football staff celebrated the commitment of their 2018 recruiting class. Along with two early commitments, this recent haul brought Tulane’s entire 2018 recruiting class to a size of 24. Though this class did not include any four- or five-star recruits, the Green Wave brought in plenty of both offensive and defensive talent that can further the rebuilding taking place on the turf of Benson Field at Yulman Stadium. This particular recruiting class consisted of 14 three-star recruits and 10 two-star recruits. Nine of the 24 recruits came locally out of Louisiana, while most others came from Mississippi, Texas or Florida. The most notable numbers, however, lie in the rankings of this recruiting class. It is ranked 70th nationally and fourth in the American Athletic Conference. This is the highest ranking of a Tulane recruiting class since 2004, the year Tulane signed current New York Jets running back Matt Forte. In terms of the characteristics of this class, there are several key takeaways. Six of these recruits, one-quarter of the class itself, are defensive linemen. This is a key area of need for the Wave, given the departure of NFL hopeful defensive end Ade Aruna. Tulane hopes this void can at least be partially filled by its top-rated recruit, defensive tackle Jeffery Johnson of Brookhaven, Mississippi. Johnson will not be without help, however, as he will be joined by the Wave’s third-ranked recruit — Juan Monjarres of New Orleans — on the defensive line. Though Fritz seemed to be primarily focused on the defensive line this recruiting season, he also seemed to put quite a bit of emphasis on strengthening the secondary. Following the departure of NFL hopeful cornerback Parry Nickerson, the Tulane secondary is in need of some fresh talent. Fritz has several recruits he hopes will fill this gap, namely safety Dorian Camel of Baton Rouge, Louisiana, safety Larry Brooks of Kennedale, Texas, and cornerback Damien Tate of New Orleans. The third and final focus in this year’s recruiting class seems to have been placed on the receiving corps. This focus seems quite unlike the team. Last year’s offense was almost entirely built around the run game and the option run. The signing of two wide receivers and two tight ends suggests that the Green Wave offense may be shifting toward more of a balanced approach in the coming year. A change like this could make the offense more adaptable to different defensive packages and ease the burden on the Green Wave’s running backs. While the Green Wave desperately needs a more dynamic offense, increasing the focus on the passing game would put pressure on returning quarterback Jonathan Banks. Thus far, Banks has been largely utilized for his running ability rather than his arm. Changing the entire dynamic of the offense would in turn require Banks to modify his skill arsenal. This would be quite the task, but if done successfully, the two-sided Tulane offensive attack could, in fact, become quite deadly. Unfortunately, the 2017 football season ended in utter shock and disappointment following the heartbreaking loss to Southern Methodist University. The revamping stemming from this 2018 recruiting class, however, gives Green Wave fans reason for great hope. 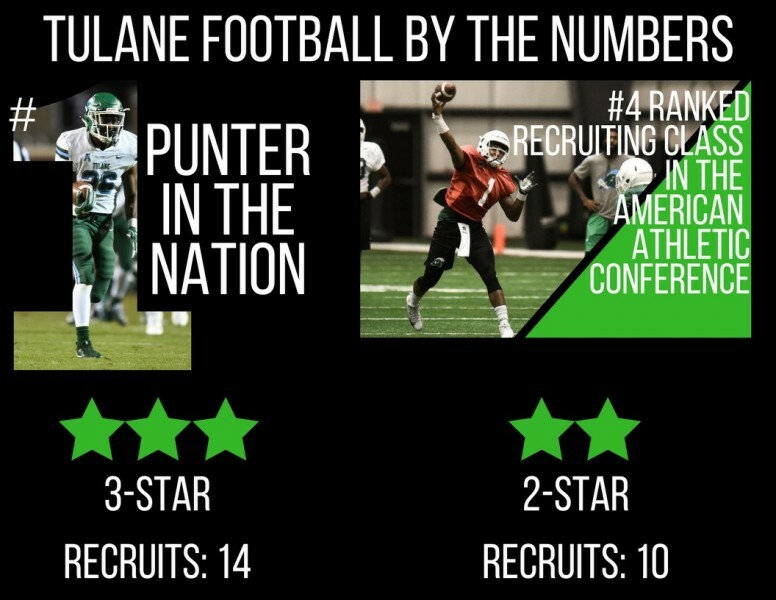 Though Tulane fell one game short of a bowl appearance in 2017, this 70th-ranked recruiting class will seek to push the Wave into bowl territory in the coming season.